Was it difficult to mortise to a consistent depth? I apologize if you spoke to this in a recent post... I'm behind on my reader, but I had to comment on the stunning end result once I saw this. I don't even see the gaps in the inlays. Amazing, and beautiful; your diligence and patience, as well as the final product. Right now I have more desire and interest than tools or know-how, but maybe one day. Just found your site. I'll definitely be back. You should be proud, as the results of your carving are terrific. Thanks! "...They're supposed to forgive imperfection. It's like a rule or something...? YOU GO GIRL!!! OMG, that's gorgeous!!! You are an arteeest! VC, I'm not a religious guy, though I admit I do pray a bit, and I pay special attention to spiritual art, it's history, traditions, and beauty... you have carved a living prayer - for a gift if I recall, a thanks between believers - and I wonder what patina of prayer and hope will attach to it after it leaves your hands, how the blessing of your carving will multiply... what wonderful work! I'd like to change my post to reflect the more thoughtful and poetic post of Anonymous. That, of course, is really what I meant. It is a piece of art that the receiver will cherish. I need to second, third, and fourth the accolades from other commenters. That is a beautiful, beautiful piece of work. Charles, I only recessed the background behind the knots by hand. I "cheated" and used a laminate trimmer to recess the inlays, but I did clean up the outside edges by hand. Carving is lots of fun and I'm sure I'll do more of it in future. I can see where taking a class with a master carver would help improve technique and speed, however. I was trying to figure out how you cut the trough for the circle portions and I appreciate that you confessed to using a laminate trimmer. Given that, in my hands, these things, like routers, have a mind of their own and like to take off in directions unknown, I'm thoroughly impressed. 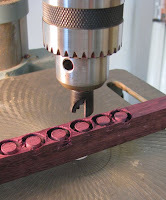 As a guy with no faith, I would have used a drill press with a forstner bit. Great stuff, Kari, and I hope you post an image of it after you oil it so we can see how the colours (Canadian spelling) of the wood work with each other. Wow Kari that came out bea-U-TEE-FUL! Thanks, guys. Mitchell, a forstner bit would be perfect for the center circle. I wished I'd had one with the correct diameter! The finish will go on this week and I'll post a photo of it. Very,very nice, just one or two observations. I'm not sure that for the purple heart works, I think I mihgt have used something darker like ebony to get a real contrast. Additionally, the purple heart won't stay that colour. I don't know what other finish would have worked to keep the lighter wood closer to its natural color. 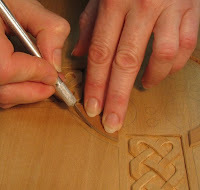 The problem is not being able to rub out the finish on the carved sections. I'm open to suggestions! I've had pretty good luck with purpleheart maintaining its color. Using the brightest purple pieces seems to be the trick. 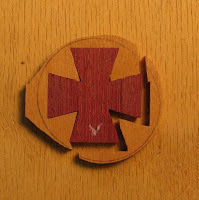 I did think about using wenge instead of the purpleheart but the grain pattern seemed too heavy for such tiny pieces. Rob, I'll give that a try next time I carve something. De-nibbing with a toothbrush is a great idea. I was also thinking some kind of spray-on finish might work. Just read your last entry...you've already put the BLO on it haven't you? I have also enjoyed reading some of your other posts. 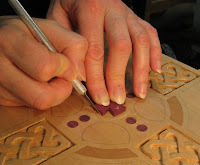 As a novice considering starting into carving, what do you think is the least number and type of chisels you could have used to do a piece (a rather remarkable one I would say)like this, and maybe describe what would be the things like inlays a novice should not try. Kari, you know me well enough to know I often talk out of my ars. But, for rubbing out the detailed sections, what about a very soft cloth wheel on a drill. Or if you need something more aggressive, something like a stimpling brush? I would think if you use one with semi coarse hair, it might take a while, but it should get the job done. Don't back out of giving it to the church. I'm sure they're not going to be as hard on you as yourself. I'm not impressed easily and you always impress me. Mike, I'm also a novice carver—this is very new to me. 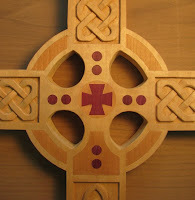 If you plan to carve this cross (size 10" x 13" x 1"), I suggest getting: 3mm straight gouge with a 5 sweep; 6mm straight chisel; 6mm straight gouge with a 5 sweep; and 12mm straight chisel (for the outside straight parts of the knots, so you can use a knife instead). You'll also want an exacto knife and/or carving knife. The two small gouges match the inside and outside curves of the knots, so you could do away with them if you are handy with a knife. 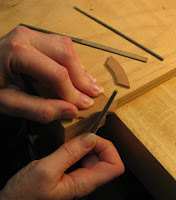 Beyond that, the smallest chisel--it's about 1/8" wide--is helpful. The two bent chisels flatten the backgroud behind the knots, but you can do it with straight chisels--it's just more difficult. You'll need either a 1/16" chisel or a dental tool to plow out the skinny area surrounding the knots if you don't get the small (2a/1) bent chisel. The big holes can be roughed out with a scroll saw and cleaned up with files, so you wouldn't need the 16mm, 7 sweep straight gouge. 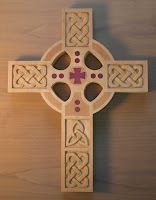 The best advice I can give you is to get a good carving book or magazine with projects in it that you like. I have Richard Bütz' "How to Carve Wood". 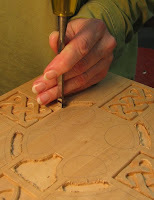 It covers relief carving, chip carving, carving in the round, and lettercarving (but a different technique than I use). 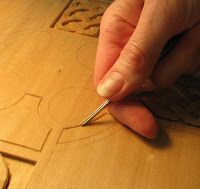 Inlay is very easy--just cut out your piece and trace around it with an exacto knife. Define the cut with a chisel or knife and continue in this manner. Deepen the cut with the knife and define it with a chisel or knife until you reach the depth you want. You can hog out the middle by hand or with a laminate trimmer. Hope this helps. Feel free to email me directly if you have more questions and I'll try to help. "I told my friend the cross looks like hell, and he said that in that case, giving it to a church would be the right place for it!" Nice work Kari. I hope the finish isn't as bad as you're making out. I use a spray pak of nitrocellulose when I want to retain light colour and minimise yellowing. I also like to leave light woods unfinished where it is practical. This option doesn't seem to get enough consideration. Kari - The cross looks great! I'm very sorry to hear that you are not happy with the finish. It is so frustrating when that happens. Do you think it will look better as it ages? Could you go with the "in for a penny..." route and add a coat of something like dark tung oil? Mark, you have a good point about leaving wood unfinished. I was concerned it would get too dirty with handling, but it's certainly a viable solution with certain pieces. Dan, I even considered painting it! ;) It's not so much that the wood darkened, it's that the basswood is now striated. The oil accentuated the tighter grain and now it's a distraction. The grain is too "loud" whereas before it was barely perceptible. Things I learned in Shop Today #8: Just because I know about imperfections in my work, doesn't mean others do! :) Cut yourself some slack. You do fantastic work! Thanks for another lesson.